Before getting my hands on an ARC of What Ends, I’d read several incarnations of the first chapter, which I loved. No, I didn’t hack into Andrew’s computer–he and I were grad school classmates and members of the same writing group. Needless to say, having read the first chapter a few times in workshop, I had pretty high expectations for the subsequent chapters, and Andrew totally delivered. 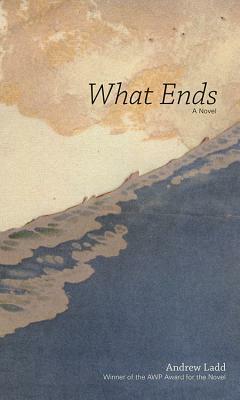 What Ends is a beautifully crafted novel about family and home and art and what ultimately connects us. Here are a few of my reasons to read What Ends. The book is primarily set on Eilean Fior, a small island off the coast of Scotland. Books about life on an island always intrigue me–how do residents define themselves by their surroundings? How do they see outsiders? What’s it like to have go to school with only your sibling for a classmate? With the island’s population shrinking, the McCloud family has to face the ending of their way of life. The novel is told in a close third-person perspective that touches on all members of the McCloud family–three children and two parents. I love that everyone gets a moment in What Ends to share their own experiences and challenges. I was especially intrigued by Maureen’s chapter, which looks at the sacrifices Maureen has made and her potential for choosing another life. Along with the shifting perspectives, What Ends also jumps around through time, during the span of about twenty years. I think this provides the narrative with a nice energy, as we get to flash between what is to come and what choices have already been made. This works particularly well between 1995 (which is focused largely on Flora) and 1988 (in which we get a closer look at Maureen). From eldest son Barry’s crush on island resident artist Bella to Flora’s relationship with mainlander Michael to Maureen’s imaginings of David to the McCloud’s marriage, Ladd creates a touching and complex portrait of love and relationships. Even when it’s painful or awkward, Ladd takes great care with his characters and their emotions. As a kid who was big into art, I’m a sucker for books about developing artists. I loved seeing Flora grow from a kid who spied on Bella to an artist in her own right. I loved getting a bit of an international perspective with What Ends. As a Scot himself, Ladd captures the rhythm of the Scottish dialect so well that I immediately heard the characters’ voices in my head. It would be accurate, it somewhat limiting, to describe What Ends as a quiet novel. Like most literary fiction I like, What Ends has a wonderful focus on language and connecting with characters. So often I had to stop and think, “Yes, that’s the perfect way to say it.” But ‘quiet’ can also suggest ‘not much happens,’ which doesn’t feel like the case for What Ends. The plot is quiet in that it’s very much rooted in characters’ daily interactions and struggles, but it never feels slow or plodding. I felt invested the whole way through, which is a testament to Ladd’s skill. What Ends is pretty firmly in the literary fiction category, but I think it would work extremely well for advanced teen readers and high school classrooms. Ladd expertly touches on the complications of growing up and growing away from the nuclear family unit–common themes in YA and for teen readers in general. Told from George McCloud’s perspective. I don’t want to spoil anything, so let me just say: all the feels. Damn you, Ladd. I had to work that pun in here somewhere, right? Andrew is not only a great writer, but he’s a good friend as well. When he’s not writing heartbreaking novels about Scottish islands, he’s editing the Ploughshares blog, doing improv, working at Edinburgh Fringe Festival, and supporting fellow writers. He’s totally unassuming and unexpectedly hilarious, and I’m so happy that the world can now get to know What Ends. What Ends is to be released on January 20, so you don’t have to wait long at all to get your hands on a copy. Pre-order now! Really made m want to read this family saga. Was introduced to Ladd in the Sept/Oct Kenyon Review. Bless ’em.